References m_hdle, m_pfnDlgProc, and m_pParent. Reimplemented in AP_Win32Dialog_FormatTOC_General, and AP_Win32Dialog_FormatTOC_Layout. 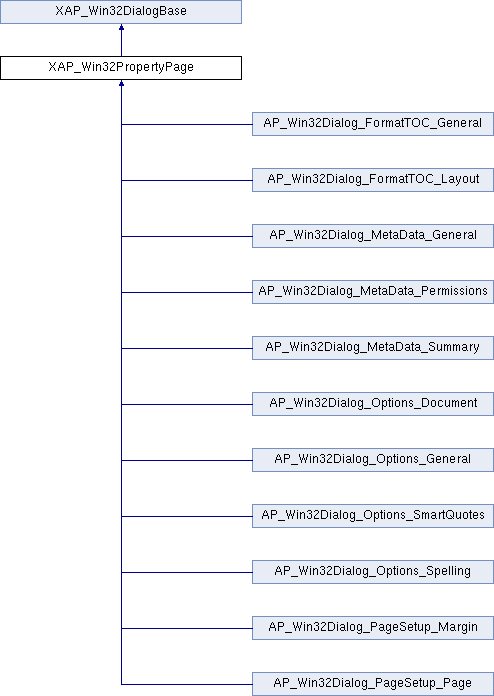 Reimplemented in AP_Win32Dialog_FormatTOC_General, AP_Win32Dialog_FormatTOC_Layout, AP_Win32Dialog_MetaData_General, AP_Win32Dialog_MetaData_Summary, AP_Win32Dialog_MetaData_Permissions, AP_Win32Dialog_Options_Spelling, AP_Win32Dialog_Options_General, AP_Win32Dialog_Options_Document, AP_Win32Dialog_Options_SmartQuotes, AP_Win32Dialog_PageSetup_Page, and AP_Win32Dialog_PageSetup_Margin. Reimplemented in AP_Win32Dialog_Options_Spelling, AP_Win32Dialog_Options_General, AP_Win32Dialog_Options_Document, AP_Win32Dialog_Options_SmartQuotes, AP_Win32Dialog_PageSetup_Page, and AP_Win32Dialog_PageSetup_Margin. Reimplemented in AP_Win32Dialog_FormatTOC_General, AP_Win32Dialog_FormatTOC_Layout, AP_Win32Dialog_MetaData_General, AP_Win32Dialog_MetaData_Summary, and AP_Win32Dialog_MetaData_Permissions. References UT_Win32LocaleString::c_str(), UT_Win32LocaleString::fromUTF8(), getApp(), XAP_Win32App::getInstance(), XAP_Win32App::getStringSet(), XAP_StringSet::getValue(), m_hdle, m_page, m_pfnDlgProc, m_pWin32App, and m_title. Referenced by AP_Win32Dialog_PageSetup_Margin::_onInitDialog(), AP_Win32Dialog_PageSetup_Page::_onInitDialog(), AP_Win32Dialog_Options_SmartQuotes::_onInitDialog(), AP_Win32Dialog_Options_Document::_onInitDialog(), AP_Win32Dialog_Options_General::_onInitDialog(), AP_Win32Dialog_Options_Spelling::_onInitDialog(), AP_Win32Dialog_MetaData_Permissions::_onInitDialog(), AP_Win32Dialog_MetaData_Summary::_onInitDialog(), AP_Win32Dialog_MetaData_General::_onInitDialog(), AP_Win32Dialog_FormatTOC_Layout::_onInitDialog(), AP_Win32Dialog_FormatTOC_General::_onInitDialog(), createPage(), and AP_Win32Dialog_Options_Document::isAutoSaveInRange(). Referenced by AP_Win32Dialog_FormatTOC_Layout::_fillGUI(), AP_Win32Dialog_FormatTOC_General::_fillGUI(), AP_Win32Dialog_MetaData_Permissions::_get_text(), AP_Win32Dialog_MetaData_Summary::_get_text(), AP_Win32Dialog_MetaData_General::_get_text(), AP_Win32Dialog_FormatTOC_General::_onApply(), AP_Win32Dialog_FormatTOC_General::_onCommand(), AP_Win32Dialog_PageSetup_Margin::_onInitDialog(), AP_Win32Dialog_PageSetup_Page::_onInitDialog(), AP_Win32Dialog_Options_Document::_onInitDialog(), AP_Win32Dialog_Options_General::_onInitDialog(), AP_Win32Dialog_Options_Spelling::_onInitDialog(), AP_Win32Dialog_MetaData_Permissions::_onInitDialog(), AP_Win32Dialog_MetaData_Summary::_onInitDialog(), AP_Win32Dialog_MetaData_General::_onInitDialog(), AP_Win32Dialog_FormatTOC_Layout::_onInitDialog(), AP_Win32Dialog_FormatTOC_General::_onInitDialog(), AP_Win32Dialog_FormatTOC_Layout::_onNotify(), AP_Win32Dialog_PageSetup_Page::doSpinControl(), AP_Win32Dialog_Options::getPage(), AP_Win32Dialog_Options_Document::isAutoSaveInRange(), AP_Win32Dialog_FormatTOC_Layout::loadCtrlsValuesForDetailsLevel(), AP_Win32Dialog_FormatTOC_Layout::saveCtrlsValuesForDetailsLevel(), AP_Win32Dialog_FormatTOC::setDetailsLevel(), AP_Win32Dialog_FormatTOC::setMainLevel(), AP_Win32Dialog_PageSetup::updateBottomMargin(), AP_Win32Dialog_PageSetup::updateFooterMargin(), AP_Win32Dialog_PageSetup::updateHeaderMargin(), AP_Win32Dialog_PageSetup::updateHeight(), AP_Win32Dialog_PageSetup::updateLeftMargin(), AP_Win32Dialog_PageSetup::updatePageSize(), AP_Win32Dialog_PageSetup::updatePreview(), AP_Win32Dialog_PageSetup::updateRightMargin(), AP_Win32Dialog_PageSetup::updateTopMargin(), and AP_Win32Dialog_PageSetup::updateWidth(). Reimplemented in AP_Win32Dialog_Options_Spelling, AP_Win32Dialog_Options_General, AP_Win32Dialog_Options_Document, AP_Win32Dialog_PageSetup_Page, and AP_Win32Dialog_PageSetup_Margin. References XAP_Win32DialogBase::_onCommand(), _onInitDialog(), _onKillActive(), _onNotify(), and XAP_Win32DialogBase::m_hDlg. Referenced by AP_Win32Dialog_MetaData_General::AP_Win32Dialog_MetaData_General(), AP_Win32Dialog_Options_General::AP_Win32Dialog_Options_General(), AP_Win32Dialog_PageSetup_Margin::AP_Win32Dialog_PageSetup_Margin(), and AP_Win32Dialog_PageSetup_Page::AP_Win32Dialog_PageSetup_Page(). Referenced by createPage(), XAP_Win32PropertyPage(), and ~XAP_Win32PropertyPage(). Referenced by createPage(), and XAP_Win32PropertyPage().